The Elgtårn is 12 metres high and is located at lake Ramstjern in Espedalen. In the bedroom section on the second floor there are 3 double “bunk beds” built into the bay windows with an aerial view of the surrounding countryside. The size of the beds - approx. 1 metre wide and 2 metres long - allows you to lie on two of them, unless you are too tall. On the third floor there is a living room with a stove, benches and tables. The stove top has cooking facilities. The tables and benches have been placed in the bay windows but they can be put together to make larger units. In addition, there are four log seats. A barbecue pan for preparing meals outside is available down by the boathouse at Ramstjern - just a 5-minute walk from the tower. Remember to take wood and whatever you need to light the barbecue with you. It is not permitted to make open fires in the vicinity of the tower. 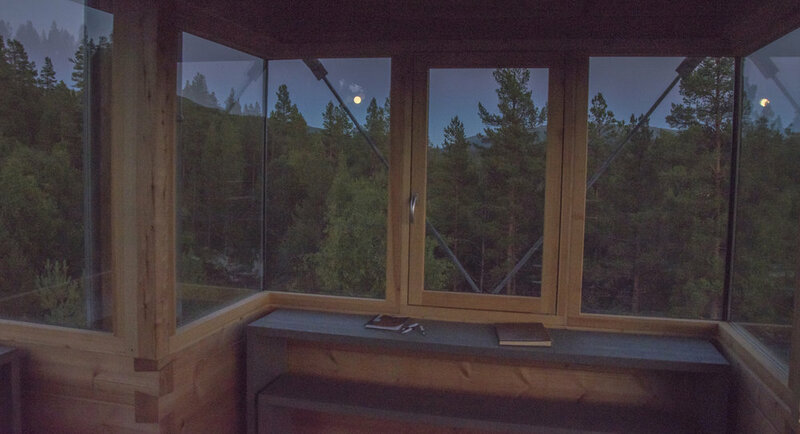 The Elgtårn is designed to give you close-to-nature experiences. It is suitable for people who like things a little primitive, with no running water or electricity. It is important for us to point out that you accept the Elgtårn in the condition in which the previous guests left it - so please leave the Elgtårn as you would like to find it when you arrive. An extension can be given if no other guests are due to arrive the following day. The stairs to the top of the tower are very steep - therefore dogs are not allowed at the Elgtårn. For this reason the tower is not suitable for people with walking difficulites either. If you have children take care when using the stairs. Access to the Elgtårn: We hope that most people will choose to arrive by transport other than car, which spoils the animal life and the tranquility of the place - your trip from the car park “on your own steam” is part of your experiencing unspoilt nature close-up. 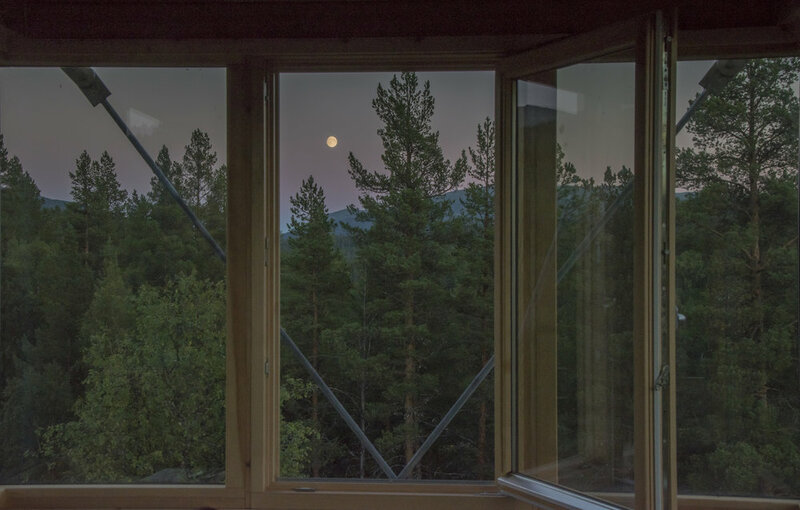 The Elgtårn is not insulated for the winter, but the size of the two rooms and the size of the stoves in each of them allow the rooms to warm up quickly once the stoves are lit - and the stoves retain the warmth for a long time. The stove in the living room has a hob - there are a small kettle for boiling water there. Entrance to the Elgtårn is via a stairway with sturdy railings. There is a door to the corridor on first floor, with a coded lock - you will be given the code when you collect the key to the Elgtårn. The same key is used for all 3 doors. The doors to the corridors can be closed and locked from inside the Tower. • Airfilled sleeping matrasses - in all "beds". • Bird seeds for the feeding machines around the tower. You will find this in the grey metal boxes in the corridor. Use a sleeping bag suitable for cold nights during the winter time. • All food - and everything you need for preparing your food as well as for eating it. WE RECOMMEND YOU USE A BACKPACK TO CARRY YOUR THINGS, AS YOU ARE WALKING APPR. 1 KM TO THE TOWER. Tip: bring a torch with you - this will come in handy if you are out when it turns dark, and particularly if you are not arriving until late in the day during the Winter. There will be a comprehensive “Elgtårn INFO FOLDER” at the Elgtårn, giving you all the information you need. It contains practical information, for example, on how to use the incinerating toilet, where you can get more water, where you can make a barbecue, where you can dispose of used water, how to use the Sun Bell lights, etc. Our aim is to preserve the nature around us in the best possible way.